In my recent article in Policy & Politics, I seek to solve this problem in three ways. Turning lessons from individual studies and systematic and qualitative reviews of the literature into a coherent MSA narrative. 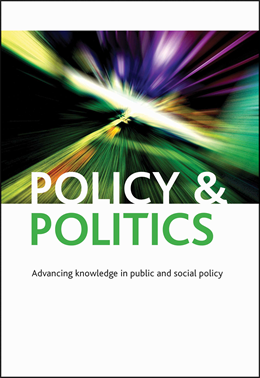 Applying this narrative to contemporary discussions of the ‘politics of evidence based policymaking’ to show how to make the MSA story as memorable, widely understood, and correctly applied as possible. The blog in this hyperlink shows how to respond to the absence of ‘rational’ and ‘evidence based’ policymaking through a policy cycle with linear stages. Focusing primarily on ‘policy entrepreneurs’ as the heroes of the MSA story. Entrepreneurs are the key actors who invest their time wisely for future reward, and possess skills that help them adapt particularly well to policymaking environments. They are the agents for policy change who possess the knowledge, power, tenacity, and luck to be able to exploit key opportunities. They draw on the following three strategies. 1. Don’t focus on bombarding policymakers with evidence. Scientists focus on making more evidence to reduce uncertainty, but put people off with too much information. Entrepreneurs tell a good story, grab the audience’s interest, and the audience demands information. 2. By the time people pay attention to a problem it’s too late to produce a solution. So, you produce your solution then chase problems. 3. When your environment changes, your strategy changes. Kingdon uses the metaphor of a surfer waiting for the big wave, but he is describing the US federal level in which there are many actors and separate authoritative venues. In the smaller subnational level, on a low attention and low budget issue, entrepreneurs can be a bit more like Poseidon moving the ‘streams’. In the US federal level, you need to ‘soften’ up solutions over a long time to generate support. In subnational or other countries, you have more opportunity to import and adapt ready-made solutions. The three strategies relate to one simple piece of advice – timing and luck matters when making a policy case – but policy entrepreneurs know how to influence timing and help create their own luck.